Batiste Dry Shampoo is always a staple in my beauty stash. It's hard to believe that this little can save my hair for the day when I haven't had time to wash it. With that in mind, I saw Asda Dry Shampoo in Exotic Tropical for £1 and decided that if that did the same job I would save money to buy that instead. Everything about this can makes it feel like it's Batiste, as odd as that sounds which they've obviously done on purpose. The scent is really refreshing and I liked it in my hair. I would say that it gives the slight whte cast that Batiste gives which despite me having dark hair, I don't mind as I just rub it thoroughly. In terms of freshening my hair, it does so the job but I have to admit, I do believe Batiste is a fraction better. The bottom line is, if I was strapped for cash I would buy this dry shampoo but I do believe that Batiste is slightly better at giving me the look and feel of clean hair. 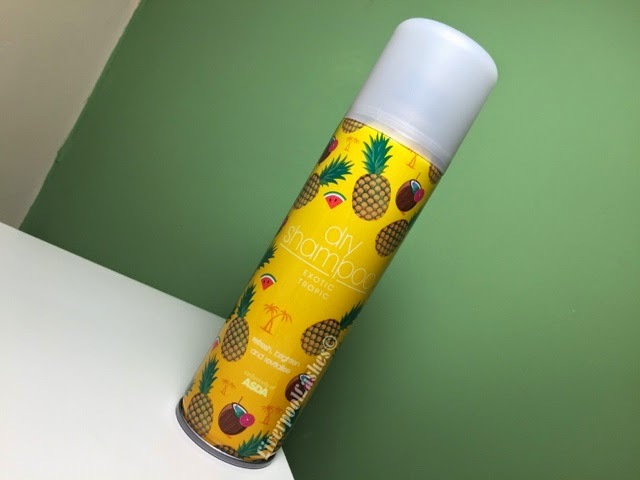 For that reason, it's likely when I'm out of dry shampoo, I would choose Batiste over it but I would still say for the price you should definitely try it out!